Nasa’s Curiosity rover has discovered conclusive proof of organic molecules in ancient Martian rocks.1 The findings add to evidence that the crater the rover landed in was once a lake and offer the tantalising possibility that it could even have supported life billions of years ago. Organic compounds, including carbohydrates, proteins and nucleic acids, are integral to life. However, many organic molecules are produced abiotically leading scientists to long suspect that they would be found on Mars. Previous missions, including Viking in the 1970s, surprised scientists, however, when no trace of these compounds was found. Since landing in the Gale Crater – now believed to be a dried up lake – in 2012, Curiosity has found hints of organics using its on-board sample analysis on Mars (Sam) instrumentation to heat soil and rock samples to analyse the gases released. However, the results were inconclusive owing to the possibility of leaking reagents. The presence of perchlorate salts in the rocks was another problem that could have thrown the analysis. These salts can break down into oxygen and chlorine when heated at 200˚C and destroy organic molecules. Now, Jennifer Eigenbrode at the Nasa Goddard Space Flight Center, US, and the Sam team have overcome these limitations. They did this by only analysing the gases released from new drill samples of three billion year old mudstone from the Gale Crater that were heated to over 400˚C. Above 400˚C perchlorates are unable to react with organic molecules, enabling the team to analyse gases from the samples without interference. The results conclusively revealed a number of organic compounds and volatiles, including thiophene, methanethiol and dimethylsulfide. High levels of sulfur in the samples are thought to have helped preserve the organics from conditions on Mars. Despite their unknown origin, the discovery of organics adds further evidence that the Gale Crater could have been an ancient lake or lakes that could have supported microbial life. ‘Organic matter is one more ingredient that could support life. Even if life was not there, organic molecules could have been food for life, providing both a carbon source and energy for organisms,’ says Eigenbrode. ‘Before this discovery we did not know if organic compounds existed in rocks on Mars,’ says Sanjeev Gupta, a planetary scientist at Imperial College London who collaborated in the study. ‘It now shows us the importance of getting samples back to Earth where we can really search for chemical signatures of life.’ In 2020, Nasa is set to send a double of Curiosity to Mars that will be able to cache samples for future return to Earth. 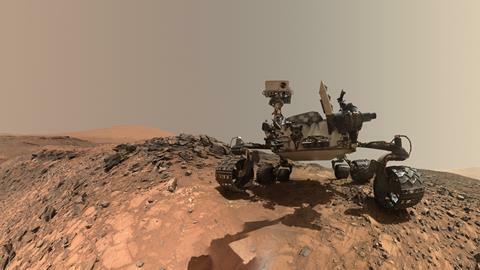 In a separate study, Christopher Webster at the Nasa Jet Propulsion Laboratory, US and colleagues on the Sam team used Curiosity’s tuneable laser spectrometer to measure atmospheric methane – a potential biosignature – over three Martian years. They found a repeating seasonal variation in the gas.2 While an uneven distribution of methane has been observed by Nasa researchers previously, the new work shows for the first time a repeating cycle of methane variation, peaking near the end of summer in the northern hemisphere. Nearly all of Earth’s methane is biologically produced, so when methane was first detected in Mars’ atmosphere in 2003 it immediately generated excitement – although its origins remain unknown. One theory is that it is formed when organic matter delivered by small meteors and interplanetary dust is degraded by UV radiation. However, Webster says this is now ruled out by the cycle of methane variation. 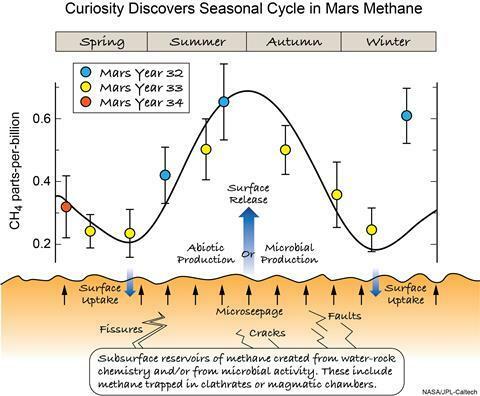 Webster explains that the seasonal cycle of methane is most likely due to reservoirs of old or new methane – produced either from life or abiotically – being stored in the cold Martian subsurface in water-based crystals called clathrates. The methane then seeps to the surface through cracks and fissures, and processes linked to surface temperature control the release of the gas to produce the seasonal cycle. Mars rover picks up chlorinated hydrocarbons on the Red Planet, but are they native or did they hitch a ride?